Hanson Audio Video, a Control4 Certified Showroom, also brings home CEDIA’s Award for Best Showroom of the Year. 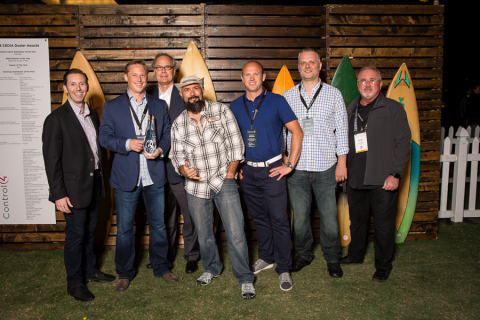 SALT LAKE CITY--(BUSINESS WIRE)--Sep. 13, 2018-- Control4 Corporation (NASDAQ: CTRL), a leading global provider of smart home solutions, celebrated its annual dealer award winners at a party hosting nearly 2,000 attendees in San Diego at the CEDIA Expo. The awards recognize Control4 Dealers in the Americas and Asia-Pacific for their commitment in providing superior smart home solutions to their customers, delivering exceptional customer service well beyond the installation, and for overall business growth and excellence. Control4 Certified Showroom Dealer, Abt Electronics in Glenview, Illinois, took the prestigious award of being named Control4 Dealer of the Year. Additionally, Control4 is pleased to congratulate two standout Control4 Dealers who took home awards from CEDIA this year. The Premier Group won the CEDIA Award for Integrated Home of the Year in the Americas; while Hanson Audio Video won the CEDIA Award for Best Showroom of the Year. CEDIA is the leading global authority in the $14 billion home technology industry, represents 3,700-member companies worldwide, and serves more than 30,000 industry professionals that manufacture, design, and integrate goods and services for the connected home. CEDIA's Awards program recognizes technical excellence, product innovation, and individual professionals succeeding in the home technology industry. THE ENTIRE LIST OF CONTROL4 AWARD WINNERS CAN BE FOUND HERE. Copyright ©2018, Control4 Corporation. All rights reserved. Control4 and the Control4 logo are registered trademarks or trademarks of Control4 Corporation in the United States and/or other countries. All other names and brands may be claimed as the property of their respective owners. All specifications subject to change without notice.